The event is free to the public and will also feature panel discussions, workshops and film screenings in addition to a mixed assemblage of celebrity talent, dance, music and art. Hosted by actor-humanitarian, Darris Love (Nickelodeon’s “The Secret World of Alex Mack”), comedienne Ramona Stephens, and comedian David Raibon. World music treats include the jazz band, Connect featuring Barbara Morrison; West African dance troupe Le Ballet Dembaya; Ali Baba from Mali with Asha Baba; Native American and Asian performers; Melvin “MDK” Kelly, the young Jimi Hendrix; and DJ Zoon and the GoGo Hoop Dance Stars to name just a few. The youth area will be hosted by teen comedienne, Leroya Sanford (“The View”) and celebrity kids from Disney and Nickelodeon will join anti-bully rapper, Chris La Vrar (“America’s Got Talent”). Family fun includes talented performers, a youth circus provided by Le PeTIT CirQue, and more fun. This event is the perfect opportunity to support a great cause to end global hunger while cross-marketing to a diverse audience and extended media reach. 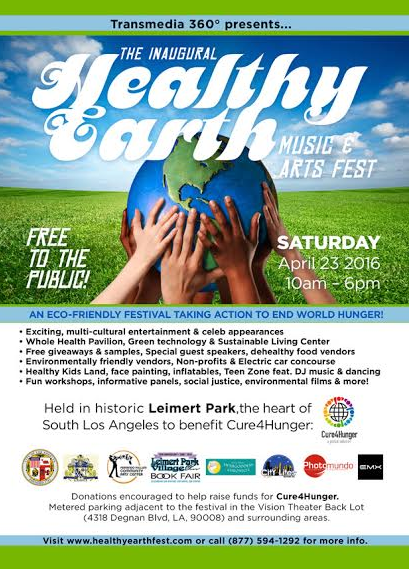 This festival’s mission is two-fold; to inspire and encourage greater Los Angeles residents to become proactive, solution-oriented citizens that regularly engage in activities leading to a healthy planet for us all. Also, as a cause-related event, they have selected, Cure 4 Hunger, (C4H), as their 2016 beneficiary organization. About C4H: One in nine people suffer from hunger on earth so to put an end to starvation, co-founders and humanitarian filmmakers, Eric W. Williams & Cylk Cozart invented a new, cutting-edge, robotic gardening technology housed inside indestructible food domes nourished from pure water extracted from the atmosphere. This organization to date has garnered the support of high profile figures such as; Martin Luther King III, NBA player, A.C. Green as well as other global Ambassadors worldwide. Please feel free to visit http://www.cure4hunger.org for more information.